Alabama Sues U.S. Government Over Plans For Syrian Refugee Settlement : The Two-Way Gov. Robert Bentley says the federal government failed to consult the state regarding refugee placement. Alabama is the second state to sue the government over the resettlement issue. Alabama Gov. Robert Bentley says the federal government failed to consult the state regarding refugee placement. Alabama Gov. 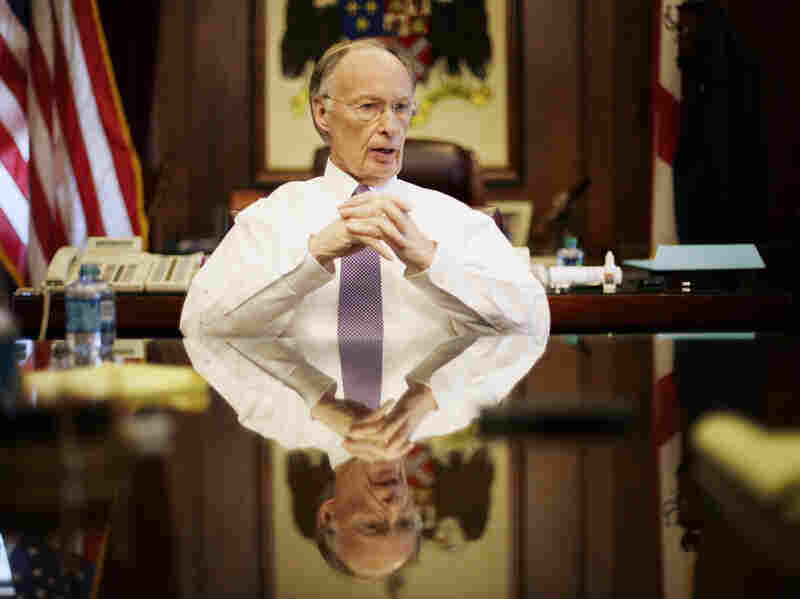 Robert Bentley announced Thursday that the state is suing the U.S. government over the settlement of Syrian refugees. The lawsuit, filed in federal court, accuses the Obama administration of violating the Refugee Act of 1980 by not consulting states on the placement of refugees. It is the second state to sue the federal government over the issue, NPR's Debbie Elliott reports. Last month, Texas sued to stop the placement of Syrian refugees in the state. That state even filed a temporary restraining order to block the arrival of the refugees, though it was later withdrawn. Bentley and Texas Gov. Greg Abbott were among dozens of mostly Republican governors who said in November that they would bar Syrian refugees from entering their states, citing fears that the refugees might not have been thoroughly screened and could pose a security risk. "My number one concern is the safety for the people of Alabama and making sure an outdated, archaic and dangerous process that excludes the states is eliminated," Bentley said in a statement. The vetting process for Syrian refugees entering the United States and other countries is a lengthy, multistep system. Refugees are initially screened by the U.N. High Commission for Refugees. Then — if they are headed to the U.S. — NPR's Brian Naylor says they must be vetted by the National Counterterrorism Center, the FBI's Terrorist Screening Center, and the Departments of State, Defense and Homeland Security. And there's another layer of screening by U.S. officials to determine whether they are indeed refugees. "These are the same folks, oftentimes, who suggest that they're so tough that just talking to Putin or staring down ISIL or using some additional rhetoric somehow's going to solve the problems out there. But apparently they're scared of widows and orphans coming into the United States of America as part of our tradition of compassion." Religious leaders in America have also urged political leaders to demonstrate leadership on the issue, as NPR's Sarah McCammon has reported. Several leading evangelical Christian churches called on those in Congress to "respond with compassion and hospitality to those fleeing violence and persecution." Meanwhile, other governors have opened their doors to refugees. Washington Gov. Jay Inslee has said he will welcome refugees, pointing out that they are already screened more closely than visitors in the U.S. on "tourist visas." Similarly, Utah Gov. Gary Herbert has said his state "will do all we can to ease their suffering without compromising public safety."